We are a mobile art studio offering fun and innovative arts programs, and instructional art for the novice and experienced artists. Choose an in-studio workshop or set up a group instructional class at your location. host an art party, company party, or fundraiser. Have a great idea? Let us design a program just for you! Choose the art program that best fits your artistic impulses. Here's where it really gets fun! Below is a list of arts programs we can offer anytime. For adults, youth, home school, after school, weekends - you choose! Barn Quilt Painting - Create your own painted quilt block. Choose one of our designs or bring your own (square) pattern. You’ll be led step by step — priming, drafting, taping, and painting. We will spend about 4 hours together with a couple of breaks, and you can work at your own pace. Our goal is to send you home with a finished 16” x 16” piece which is perfect for mounting on smaller buildings. If hanging outdoors, we recommend that you apply at least 2 - 3 coats of a recommended sealer at home. All other materials are provided. Acrylic Fluid Abstract Painting - Try a fun and therapeutic style of painting and get a glimpse in to the world of Flow Art. It's a very abstract, no rules style of art that frees your mind from the traditional and let's it wander to the unknown. Learn techniques like 'dirty pour", "flip cup", "swipe" and more! Board String ART - First popular in the late 1960s, string art is making a come back! In this program participants choose a pattern, paint their board, then use a hammer to drive nails around the pattern. Once the nails are in place, multi color string is available to fill it in using crisscross patterns! It is much easier than it looks! Paint your Home on Canvas - Come enjoy painting with your friends. We'll walk you through step by step. For this program, you will need to send a clear (not blurry) image of your house, or church perhaps. WE will presketch on canvas. Painting WITH Wine - Yes, now you can drink your wine and paint with it too! Another step by step program showing you all the techniques you need to create a lovely painting with wine and a few pigments. Much like watercolor painting, you'll learn basic setup, mixing, and how to create depth, highlights and shadows. 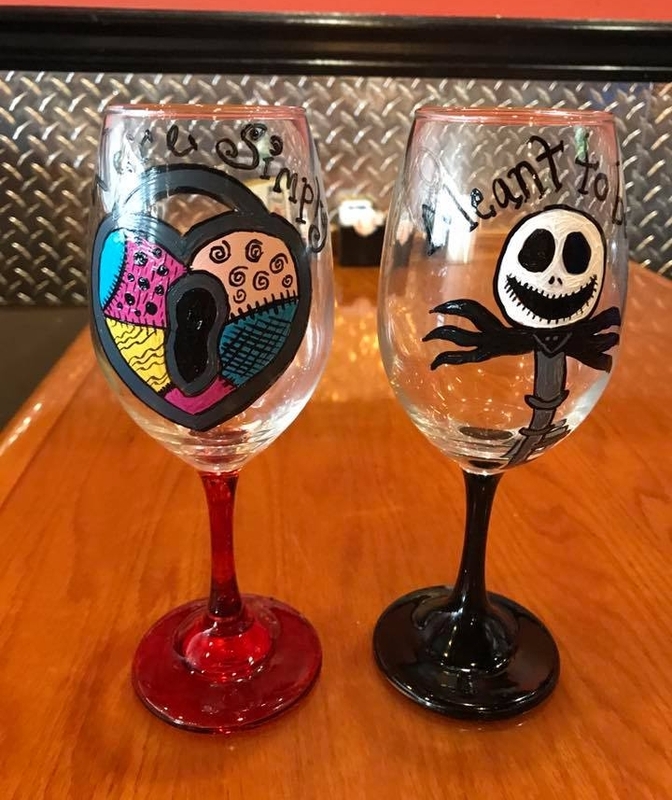 Beer & Wine Glass Painting - You can paint your wine art and drink it too! Create a work of art on a wine glass rather than a canvas. Choose a design template or paint your favorite quote with the assistance of an artist on premises to help you with any little detail. Materials and 2 wine glasses are provided; bring your own unique glass if you prefer. Glasses are ready to drink from within 48 hours. 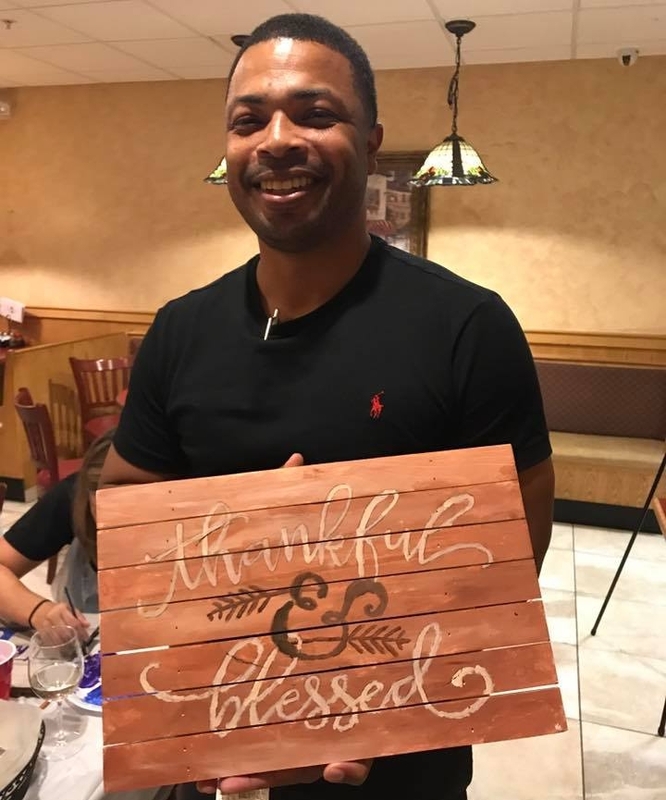 Pallet Painting - Painting on wood! Choose a 3 – 6 word phrase or quote, and email it to us for a pre-design. Designs are transferred on to an 11” x 18” pallet by the participant on the day of the event. You can then choose to do a wash of color on the pallet or use an unpainted background. The foreground is also painted with your choice of colors, all with the help of Tutoring Art’s professional artists! Painting Paws - With this one, you get to paint a furry friend on canvas! Send us a picture of your pet or any dog, cat, bird, etc., so we can pre-sketch, and we’ll help you paint a masterpiece to take home and enjoy. No experience needed. Delightfully fun for animal advocate organizations and their donors! Step by Step Painting - Plan a traditional painting party. An artist will walk you step by step to complete your own version of an original acrylic painting on a 12" x 16" or 16" x 20" canvas. Additional sizes are available by request. Easels and all materials are provided, so relax and enjoy some art therapy! Tote Bag Painting - Much like step by step painting, you choose a design and we paint on tote bags. Choose from canvas painting designs or pallet quotes. Large canvas totes will be used. Watercolor Painting - As an option, wine and painting sessions may be instructed with watercolor pencils and brushes in place of acrylics. Create a painting or perhaps greeting cards for a special holiday. All materials are provided for you. Watercolor Botanicals - For your garden club or any botanical enthusiasts! Learn the basics of Botanical Art with water color. You will create a floral masterpiece on a large note card, or watercolor paper ready for framing or mailing as a special gift. Watercolor and watercolor pencils are used. Painting with a Twist- A cross between speed dating and musical chairs. 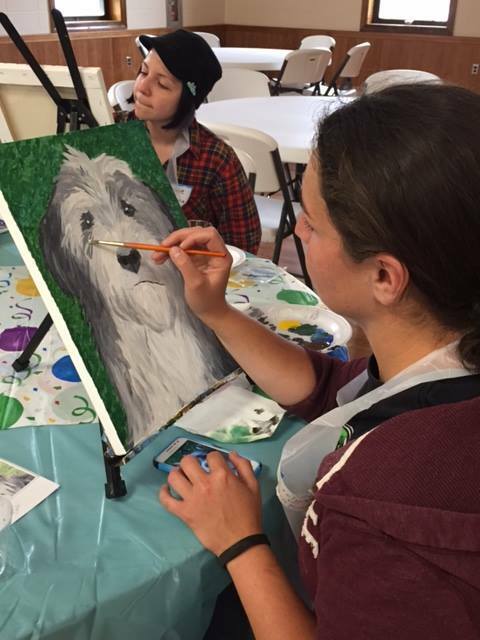 Your group will follow a step by step painting, with a twist: every 10 minutes, you will change seats with another painter and continue to paint on the new canvas in front of you. Your Fitbit will surely track those extra steps! At the end, everyone returns to finish their original canvas they started with and you take home a group creation. A super fun activity for birthday parties, close friends and even office parties. Modern Art - Plan a painting session to create modern art that fits any room in your house. You choose the color scheme! Various canvas sizes are available. Bring your spouse or a friend and paint 2 large paintings to go over your couch, or a paint something as a gift. A 3 hour session ranges $30 - $60 per person depending on the size of the canvas. With modern art, anything goes. So no pressure. You'll go home proud of your masterpiece! Chalk & Photography - Teaming up with a professional photographer to illustrate chalk designs for photo shoots. Great program for company picnics and family reunions. Sitting fees apply; you own all the digital images. Please LIKE our Facebook page and explore our other program's art galleries.